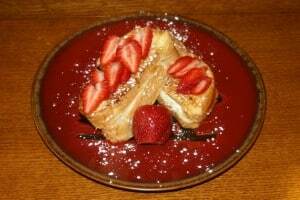 Looking for a yummy strawberry cheesecake French toast recipe? Guests at our Hot Springs Arkansas bed and breakfast were treated to this pretty dish on Valentine’s day! In a small bowl, combine ricotta, sugar and vanilla; mix well. Spread 2 Tablespoons each on eight slices of bread; cover with remaining bread. In a bowl, beat eggs and milk; soak sandwiches 1-2 minutes per side. Cook on a hot greased griddle for 5 minutes on each side or until golden brown and heated through. Serve with strawberries. Top with confectioners’ sugar or maple syrup. This entry was posted in bed and breakfast, recipes by admin. Bookmark the permalink.